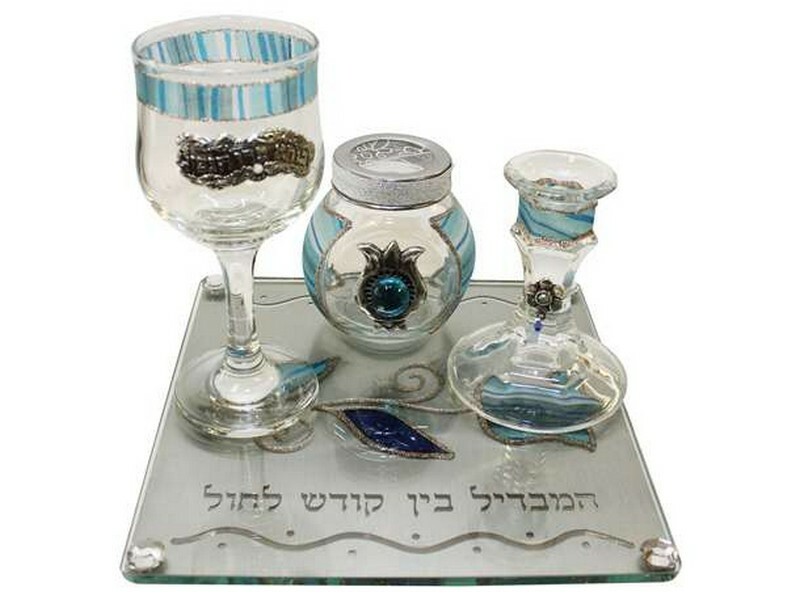 This beautiful glass havdalah set includes all the items needed - a cup, candle and besomim Spice Box holder along with a matching square plate. Artistically decorated this set has ocean blue coloring with silver colored plaques accenting each piece. A plaque which reads “Boreh Pri Hagafen”, the blessing made on wine and grape juice, decorates the cup. The plate has a contemporary look with laser cut words of “Hamavdil Bein Kodesh L’Chol”, He who separates the holy from mundane. The plate is also decorated with a large tulip in the center decorated in blue coloring. This lovely havdala set will surely take center stage during the Havdalah ceremony.